The Army Air Corps (AAC) is a component of the British Army, first formed in 1942 during the Second World War by grouping the various airborne units of the British Army (which are no longer part of the AAC). Today, there are eight regiments (seven Regular Army and one Reserve) of the AAC as well as four Independent Flights and two Independent Squadrons deployed in support of British Army operations across the world. 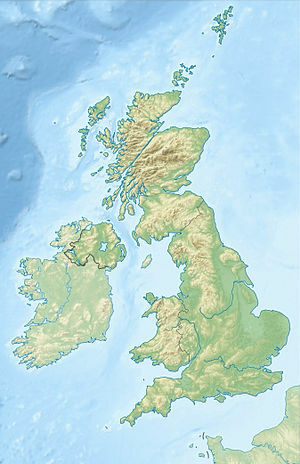 They are located in Britain, Brunei, Canada, and Germany. Some AAC squadrons provide the air assault elements of 16 Air Assault Brigade through Joint Helicopter Command. Cap Badge of the Army Air Corps. The British Army first took to the sky during the 19th century with the use of observation balloons. In 1911 the Air Battalion of the Royal Engineers was the first heavier-than-air British military aviation unit. The following year, the Battalion was expanded into the Military Wing of the Royal Flying Corps which saw action throughout most of the First World War until 1 April 1918, when it was merged with the Royal Naval Air Service to form the Royal Air Force. Between the wars, the Army used RAF co-operation squadrons. At the beginning of the Second World War, Royal Artillery officers, with the assistance of RAF technicians, flew Auster observation aircraft under RAF-owned Air Observation Post (AOP) Squadrons. Twelve such squadrons were raised —three of which belonged to the RCAF— and each performed vital duties in a wide array of missions in many theatres. Early in the war, Winston Churchill, Prime Minister of the United Kingdom, announced the establishment of a new branch of army aviation, the Army Air Corps, formed in 1942. The corps initially comprised the Glider Pilot Regiment and the Parachute Battalions (subsequently the Parachute Regiment), Air Landing Regiments, and the Air Observation Post Squadrons. In 1944, the SAS Regiment was added to the Corps. One of their most successful exploits during the war was Operation Deadstick, including the attack on Pegasus Bridge, which occurred on 6 June 1944, prior to the landings on Normandy. Once the three gliders landed, some roughly which incurred casualties, the pilots joined the glider-borne troops (Ox & Bucks Light Infantry) to act as infantry. The bridge was taken within ten minutes of the battle commencing and the men there withstood numerous attempts by the Germans to re-capture the location. They were soon reinforced and relieved by soldiers from Lord Lovat's 1 Special Service Brigade, famously led by piper Bill Millin. It was subsequently further reinforced by units of the British 3rd Division. The AAC was broken up in 1949, with the SAS returning to its independent status, while the Parachute Regiment and Glider Pilot Regiment came under the umbrella of the Glider Pilot and Parachute Corps. The pilots who had once flown the gliders soon had to transfer to flying powered aircraft, becoming part of the RAF Air Observation Post (AOP) Squadrons, several of which were manned by reserve personnel. In 1957 the Glider Pilot and Parachute Corps was split, with the Parachute Regiment becoming an independent formation, while the Glider Pilot Regiment was merged with the Air Observation Squadrons of the Royal Artillery into a new unit, the Army Air Corps. From 1970, nearly every army brigade had at least one Aviation Squadron that usually numbered twelve aircraft. The main rotor aircraft during the 1970s were the Westland Scout and Bell Sioux general purpose helicopters. The Sioux was replaced from 1973 by the Westland Gazelle used for Airborne reconnaissance; initially unarmed, they were converted to carry 68mm SNEB rocket pods in 1982, during the Falklands War. The Scout was replaced from 1978 by the Westland Lynx, which was capable of carrying additional firepower in the form of door gunners. Basic rotary flying training was carried out on the Sioux in the 1970s, on the Gazelle in the 1980s and 1990s, and is currently conducted on the Eurocopter H145 through the Defence Helicopter Flying School. Fixed-wing types in AAC service have included the Auster AOP.6 and AOP.9 and DHC-2 Beaver AL.1 in observation and liaison roles. Since 1989, the AAC have operated a number of Britten-Norman Islander and Defender aircraft for surveillance and light transport duties. The corps operated the DHC-1 Chipmunk T.10 in a training role until its replacement by the Slingsby T67 Firefly in the 1990s. The Firefly was replaced by the Grob Tutor in 2010. 657 Squadron AAC, Colchester Garrison, (Anti-Tank, 4x Gazelle AH.1, 12x Lynx AH.7), supported 9th Infantry Brigade; joined 9 Regiment AAC in July 1990. A further boost in the Army Air Corps' capability came in the form of the Westland Apache AH.1 attack helicopter. In 2006, British Apaches deployed to Afghanistan as part of the NATO International Security Assistance Force. The strength of the Army Air Corps is believed to be some 2,000 Regular personnel, of which 500 are officers. However, the AAC draws an additional 2,600 personnel from the Royal Logistic Corps and the Royal Electrical and Mechanical Engineers. Therefore, total related Army Air Corps personnel is around 4,600. In October 2011, the Army Air Corps adopted their first Corps Mascot: Zephyr, a bald eagle. The AAC operates fixed-wing and rotary-wing aircraft. The AAC uses the same designation system for aircraft as the Royal Air Force and the Fleet Air Arm. Two types of fixed-wing aircraft are operated by the Corps, primarily for reconnaissance purposes: the Britten-Norman Islander AL1 and the Britten-Norman Defender AL1/AL2/T3. The Defenders are also employed in the command and communication role with limited use in transporting personnel. Additionally, AAC pilots use the fixed-wing Grob Tutor for Elementary Flying Training (at Army Flying Grading & DEFTS). Today the larger section of the AAC is the rotary-wing part. Its aviators fly four types of helicopter, and within each type there are usually several marks/variants which carry out different roles. Pilots designated for rotary-wing service train at the Defence Helicopter Flying School, RAF Shawbury. The School is a tri-Service organisation consisting of civilian and military instructors that take the student from basic flying through to more advanced flying such as instrument flying, navigation, formation flying and captaincy. In service rotary-wing aircraft include: the Bell 212HP AH1, the Eurocopter AS365N3 Dauphin II, the Eurocopter Squirrel HT2, the Westland Gazelle AH1, the Westland Wildcat AH.1 and the AgustaWestland Apache AH1. 653 Squadron is to be an Operational Training Squadron from 2015. 1 and 9 Regt AAC will merge under one headquarters (1 Regt AAC) and re-locate to RNAS Yeovilton to form a large regiment equipped with the new AgustaWestland Wildcat helicopter. The Regular component of Army Air Corps capability will consist of two regular aviation regiments equipped with Apache, one large regular aviation regiment equipped with Wildcat, and one regular manned aerial surveillance regiment, although the Gazelle out-of-service date is currently 2018 and it has not yet been confirmed whether or how the capability will be replaced. All five squadrons from 1 and 9 AAC will remain. Four squadrons will be the front line Lynx Wildcat squadrons, one (652 Squadron) will become the Wildcat Operational Conversion Squadron. There will be two frontline squadrons of Apache helicopters in both 3 and 4 Regiment AAC, with 3 Regiment also parenting the Apache OCU, 653 Squadron. One Regiment will be at high readiness at any one time. One of the squadrons will be attached to HMS Ocean and/or the new Queen Elizabeth-class aircraft carriers for expeditionary operations. Another will be attached to the lead armoured battlegroup. However, under Army 2020 Refine, 3 Regiment AAC will be tasked to support the armoured infantry, and strike brigades of 3 (UK) Division and 4 Regiment AAC will support the army's 16 Air Assault Brigade and 3 Commando Brigade of the Royal Marines. With the retirement of the Gazelle fleet and the transfer of the AAC's Islander aircraft to the Royal Air Force (both scheduled for 2018), 55 Regiment AAC will be transferred to the Royal Air Force. The Army's training structure will remain broadly the same. Training of future Army Air Corps aircrew will be delivered by the joint service UK Military Flying Training System. Elementary Flying Training will continue to be delivered at RAF Cranwell, alongside Royal Navy students. ^ "World Air Forces" (PDF). Flight International. 2014. Archived (PDF) from the original on 26 October 2018. Retrieved 25 August 2014. ^ Farrar-Hockley 1994, p. 9. ^ Farrar-Hockley 1994, p. 17. ^ Farrar-Hockley 1994, p. 41. ^ Rawlings 1984, pp. 255-259. ^ Rawlings 1984, p. 259. ^ Halley 1988, pp. 444-451. ^ Jefford 2001, pp. 102-105. ^ Farrar-Hockley 1994, pp.179, 187-194. ^ "Gazelle - British Army Website". Army.mod.uk. Archived from the original on 10 April 2017. Retrieved 27 September 2016. ^ "Royal Army Service Corps". British Army units 1945 on. Archived from the original on 5 June 2017. Retrieved 2 July 2017. ^ "Army Air Corps". Helis. Archived from the original on 3 August 2017. Retrieved 2 July 2017. ^ "BAOR Order of Battle July 1989" (PDF). Louis Vieuxbill. Archived (PDF) from the original on 14 September 2016. Retrieved 2 July 2017. ^ "Aviation". Ministry of Defence. Archived from the original on 16 June 2017. Retrieved 2 July 2017. ^ "Zephyr – the Army Air Corps mascot". Ministry of Defence. Archived from the original on 21 June 2017. Retrieved 16 July 2017. ^ "Islander". mod.uk. Archived from the original on 13 March 2008. Retrieved 7 August 2016. ^ "Britten-Norman Aircraft has an EASA approved design bureau which operates under EASA Part 21 Sub Part J and under Ministry of Defence DAOS". Britten-Norman. Archived from the original on 19 September 2018. Retrieved 18 September 2018. ^ "Royal Air Force Grob Tutor". Royal International Air Tattoo. Archived from the original on 19 September 2018. Retrieved 18 September 2018. ^ "Bell 212 - British Army Website". Army.mod.uk. Archived from the original on 23 January 2014. Retrieved 27 September 2016. ^ "Photos: Eurocopter AS-365N-3 Dauphin 2 Aircraft Pictures". Airliners.net. 20 November 2008. Archived from the original on 30 July 2010. Retrieved 11 May 2014. ^ "Squirrel". mod.uk. Archived from the original on 13 March 2008. Retrieved 7 August 2016. ^ "Gazelle". mod.uk. Archived from the original on 13 March 2008. Retrieved 7 August 2016. ^ "Westland Wildcat". mod.uk. Archived from the original on 13 March 2008. Retrieved 7 August 2016. ^ "Attack Helicopter". mod.uk. Archived from the original on 13 March 2008. Retrieved 7 August 2016. ^ "The Eagle" (PDF). Autumn 2014. Archived (PDF) from the original on 18 August 2016. Retrieved 27 September 2016. ^ "Army 2020 Reserve Structure & Basing" (PDF). Archived (PDF) from the original on 22 July 2017. Retrieved 30 May 2015. 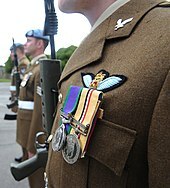 ^ "Army to reduce by 23 units - British Army Website". Army.mod.uk. 5 July 2012. Archived from the original on 22 May 2013. Retrieved 11 May 2014. ^ "Army Air Corps future structure". UK Armed Forces Commentary. Archived from the original on 30 May 2015. Retrieved 30 May 2015. ^ Tim Ripley, London - IHS Jane's Defence Weekly (13 October 2013). "British Army helicopters leave Germany - IHS Jane's 360". Janes.com. Archived from the original on 6 October 2014. Retrieved 11 May 2014. ^ Anonymous (8 July 2014). "654 Squadron's Last Parade Before Disbandment". forces.tv. Archived from the original on 6 March 2016. Retrieved 7 August 2016. ^ Ripley, Tim (9 February 2017). "UK re-roles Apache attack helicopter units". IHS Janes. Archived from the original on 13 August 2017. Retrieved 13 August 2017. ^ Tim Ripley (14 September 2016). "UK MoD looks to transfer Army Defender and Islander aircraft to RAF". Archived from the original on 13 August 2017. Retrieved 13 August 2017. Farrar-Hockley, General Sir Anthony. The Army in the Air: The History of the Artmy Air Corps. Stroud, Gloucestershire, UK: Alan Sutton Publishing Ltd., 1994. ISBN 0-7509-0617-0. Wikimedia Commons has media related to Army Air Corps (UK).